About a week ago we reported about the news that Yahoo is testing a new home page design. Since then, we have really not heard any chatter about people actually seeing the design in place. I personally see the old design and that is expected because Yahoo is testing out the new design on a test group. Last night, a DigitalPoint Forums thread started, telling members that he saw the new design. This user was using Internet Explorer and was automatically redirected from www.yahoo.com to m.www.yahoo.com. Clicking on m.www.yahoo.com will not load the new design for everyone, because most users who tried it, including myself, do not see the new design. 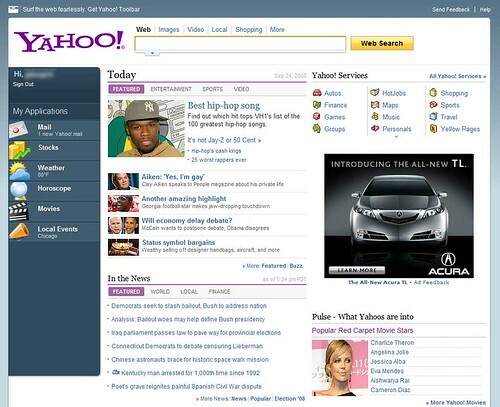 It is a simpler design, but will Yahoo users like it?